NOTE: This is a guest post by Deb Davis. Deb is a writer, artist and naturalist who works for the Forest Service in central Washington. You can read about her experiences monitoring wild fires, maintaining backcountry trails and being a snow ranger on the I-90 corridor; her observations and reflections on the natural world; and her celebrations of her homegrown, handmade life on her blog, Fieldwork. Winter couldn’t end soon enough. The world outside my windows was drab and mushy as the snow melted. I was ready for a change, for more color in my life. The world inside my house was drab in places too, and my eyes kept going to the bright spots. A yellow mixing bowl that had belonged to my grandmother. A linen towel that I’d found at the antique mall, one of those that has a calendar for the whole year. When I saw that the year was 1960, and my birthday—the first day of spring—was a Sunday highlighted in red, I knew I had to have it in my house. The cheerful folk art design features figures in blue, green, red and yellow and brightens the kitchen wall. After a divorce eight years ago, I downsized my belongings and moved to a tiny cottage. At the time, I was content with a few heavy utilitarian white china plates. My knives were dull and the kitchen utensils were mix-and-match. Dishtowels were old and faded. These things were good enough as I put my life back together and recovered from a serious illness. It was clear that I would survive, and I felt ready to celebrate and upgrade my surroundings. What would it be like to have well-designed things created with a sense of craftsmanship, that complemented each other and were fun to use? I contacted Marilyn about weaving a towel for my birthday. This would be a gift to myself. 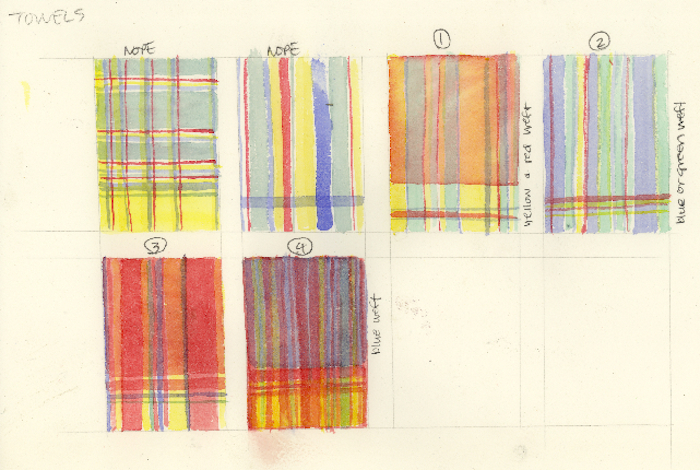 Inspired by my old linen calendar towel, I started playing with color combinations in watercolor. Just some little sketches to give Marilyn an idea of what I had in mind. We talked about texture and decided on some twill variations that would make a sort of diamond pattern in the cloth. She sent thread samples so I could see the colors for myself. 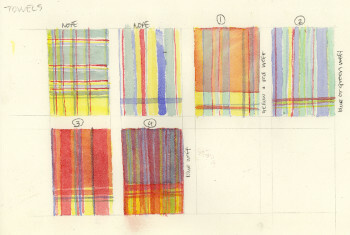 The whole process was a collaboration as we talked and emailed back and forth. I couldn’t wait to see what she wove. Finally she emailed photos of five finished towels. I pored over them, and finally made my choice. When the package came, I was so excited. My birthday had passed, but when the towel arrived it felt like a red-letter day. At first I couldn’t use it. I left it in the kitchen where I could admire it, and feel the sturdy cotton cloth. The colors delighted me, with stripes in yellow, red, blue and green. The selvedges were perfect, with the hems sewn by hand. I could hardly believe that this beautiful thing was mine. One day I kneaded bread dough and set it to rise in my grandmother’s yellow bowl. I unfolded the towel, draped it over the bowl and watched as the bread rose up under it. The towel was meant to be used. It’s been a year now, and the towel has been used and washed and used more. 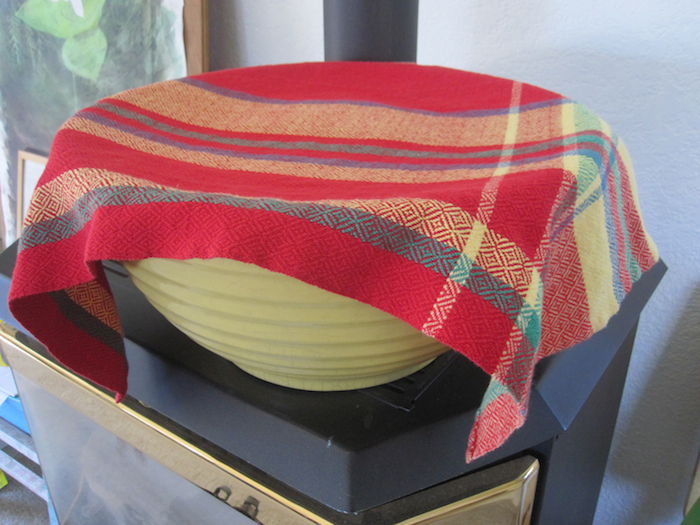 I sent for square Fiestaware plates in red, yellow, green and blue to match the towel. I sent for a really nice garlic press that is easy to use and clean. When I use all these things, I am reminded of the fun I had working with Marilyn. 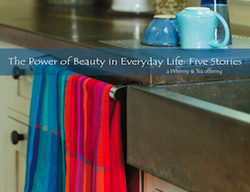 How the towel was the start of deliberately adding color and craftsmanship to my every day life, including red which has always seemed too loud and brash to me. But now I like it — it’s warm and lively, the color of tomatoes and strawberries and autumn leaves. Red plays well with other colors. A year later the snow is melting, and my birthday approaches. I’ve sent for another towel to go with the first towel and all the other colorful useful things. Life feels rich and bright even in the midst of drabness. There’s no going back now — every day can be a red-letter day. My invitation to you: What’s one thing that makes your life feel rich? I’d love to hear.